This porcelin-smooth percale is tailored with six rows of precise pintucks. 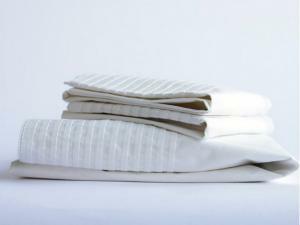 An elegant pintuck finish to fine, smooth organic cotton percale flat sheet and pillowcase sets. The perfect companion, our 300-thread-count percale fitted sheet has a deep 15" pocket and full elastic for a good fit on a range of mattresses. These sheets & cases have understated elegance and defined style. Coyuchi sheets are woven with 100% Organic cotton fibers, certified by SKAL in compliance with the International Federation of Organic Agriculture Movements (IFOAM) standards. Enjoy these luxury linens and rest safe and sound knowing that you and your family are sleeping on totally chemical-free bedding! All Earthsake organic linens assure a safe & comfortable night's sleep - a natural good night sleep for everyone! Coyuchi organic cotton linens are made from hand picked organically grown cotton, certified by SKAL. Luscious fibers, beautiful finish; bedding you can feel good about! Pintucks only available on FLAT sheets & Cases in White that you can pair with the Organic Percale Flat Sheets and top it all off with Coyuchi Pleated Sateen Duvets & Shams - All available in great contrasting colors to complete a distinguished look for your bed.